One of the main reasons that I started blogging about modest fashion was because I wanted it to be something more meaningful than fashion as know it. I wanted it to be more inclusive of all shapes, colors, and sizes. I wanted it to inspire and empower us as Muslim women. I wanted it to give back something to our greater community. That is why I am so eternally grateful to have had the chance to volunteer with Fashion Fighting Famine for their San Francisco show because that is exactly what they stand for. Not only does the organization raise money for local charities within our communities, it does it while inspiring generations of women that modest fashion can be beautiful inside and out. From the executive members of the organization, all the way to the models, there was a collaborative spirit throughout. If someone needed help unloading a car, there were helping hands. If someone fainted, there was a sister to pick her back up. If there was work to be done, sisters would pitch in. As someone who has seen tradition fashion shows from the behind the scenes, there was no diva behavior at FFFSF and I truly believe it is because the beauty of the Adab (etiquette of Islam) of the Prophet (saws). Seeing this beauty behind the scenes gave me my own courage to face the crowd and be able to MC the show. What a wonderful experience that was! To see a crowd of beautiful women of all ages smiling back at me made me realize that Allah (swt) made us all beautiful alh. By the grace and mercy of God, I felt like after the first few minutes of being nervous that all my fears went away and I was able to not only enjoy the show, but feel honored to help a wonderful charity like the North American Islamic Shelter for the Abused. So often, the Muslim community ignores domestic violence as an issue. Thanks to the amazing volunteers and the guests of this fashion show, we are able to give these voiceless women a voice in our community. I sincerely hope that all of my readers reflect on how just one person can make a huge impact by way of example of this show. 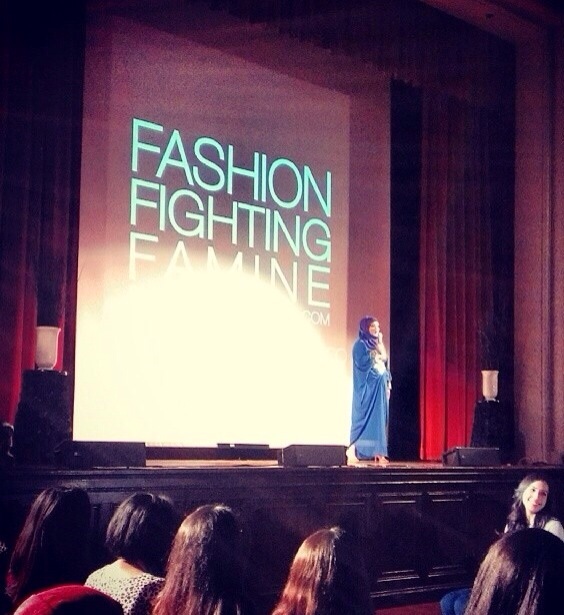 Anum, one of the executive members of Fashion Fighting Famine, pushed the group to have a second show based in San Francisco. Thanks to her, she motivated hundreds of women to travel from Dubai, LA, and all over to help our community! So never feel defeated to give back my readers. If at first you don’t succeed, try, try, try again. PS: Major thank you to Rahat for glamming me up. And thank to all of you awesome ladies for showing up to the show!